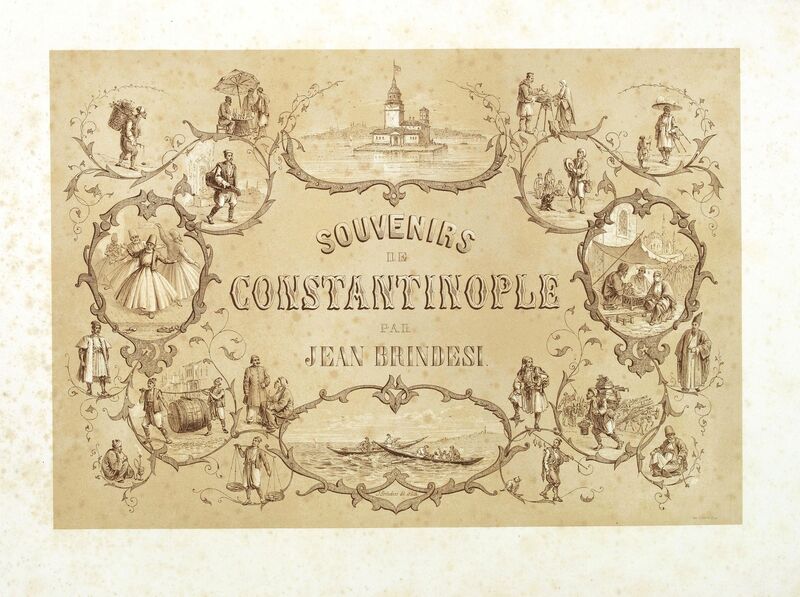 BRINDESI - (Title page) Souvenirs de Constantinople . . .
BRINDESI, J. - (Title page) Souvenirs de Constantinople . . .
(Title page) Souvenirs de Constantinople . . . - BRINDESI, J. Title : (Title page) Souvenirs de Constantinople . . ..
Map maker : BRINDESI, J.. Date : Paris, Lemercier, 1855-1860. Size : 10.0 x 14.6 inches. / 25.4 x 37.0 cm. Description :Title page from the famous work "Souvenirs de Constantinople" drawn and lithographed by Jean Brindesi. Surrounded by locals in typical dress, and "Maiden's Tower" in top. Maiden Tower is a small and picturesque castle, built upon a rock in the Bosporus that its foundations cover the whole surface, and give to the edifice the appearance of floating upon the waves. Jean Brindesi was born in 1826 and worked primarily as a watercolour artist. During the Abdulmecid period (1831-1861), he worked on scenes involving soldiers in Istanbul. Two albums of lithographs after his drawings were produced by Lemercier in Paris : Elbicei Atika – Musee des Anciens Costumes Turcs de Constantinople, 1855, and Souvenirs de Constantinople, 1860 , these two works are collections of picturesque views of the city of Constantinople. The originals are kept at the Istanbul Topkapi Palace Museum and at the University of Istanbul. While the first album represents the government and military dignitaries, the second one tries to capture the atmosphere of day-to-day life in Istanbul through quaint and lively depictions. Jean Brindesi died in Istanbul in 1888. Condition : Lithography on tinted grounds. Paper slightly age-toned and some small spotting. In good condition.